In the past, we've discussed the fact that when certain movies are done well, they can be both educational and informative. Of course, fictional films aren't documentaries, but when a movie tackles a specific topic, especially one which may be somewhat foreign to most in the audience, we can walk away learning a little something. Most people aren't allowed inside of the kitchens at five-star restaurants, which is where the world of Burnt takes place. But, instead of a gourmet crash-course, all that we learn is that melodrama is alive and well in the cooking area. 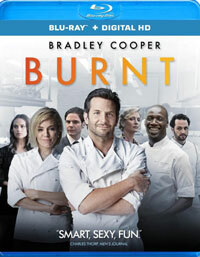 Bradley Cooper stars in Burnt as Adam Jones, a chef who was once a hot-shot in Paris. But, drinking, drugs, and an arrogant demeanor ruined his burgeoning career and burned bridges with his friends and colleagues. Having completed a self-imposed exile in New Orleans, Adam travels to London, where he approaches his old friend, Tony (Daniel Bruhl), who is managing his father's hotel. Adam convinces Tony to let him take over the restaurant and soon Adam has put together a crack team of chefs to help him achieve his goal of being a Michelin 3-star chef. However, Adam's road to redemption involves continued self-growth and the realization that he can't do it alone. The conceit of Burnt is that it wants to combine two movies. On the one hand, it's a dramatic tale of redemption, as Adam works his way back into the world of fine dining and his pursuit of his third star. The part of movie is filled with serious moments in which Adam attempts to mend fences and repair the bridges which he burned so long ago. It then gives way to melodrama, as the strict chef begins to show his human side with Helen (Sienna Miller) and her daughter, Lily (Lexie Benbow Hart). The other part of the movie is a hard-hitting and fast-paced look into the kitchen of a gourmet restaurant. We see how Adam runs the kitchen like a boot camp, throwing away dishes which aren't perfect and berating the cooks who make mistakes, while they all answer him with "Yes, Chef!". We see them get burned, break plates, cry, and then come back early the next day to start again. However, neither of these movies gel. It doesn't quite reach the level of feeling like someone edited two movies together, but it comes close. The kitchen scenes are authentic and riveting. Adam truly becomes the villain of the film in those scenes and we wonder why in the world anyone would want to work in that kind of environment. We see the hustle and bustle and wonder how anyone knows what they are doing, and we are left wanting more (more on that in a moment). In contrast, the dramatic scenes come across as saccharine and phony. "Oh, look at Adam, he's morose. Now, look at Adam, he feels guilty." Adam was such an unlikable (yet fascinating) character in the kitchen scenes, that I had no interest in feeling anything for him or getting involved in his feelings. And the romantic angle could not feel more forced. Again, I didn't expect Burnt to be a documentary, but the movie missed a great opportunity to really let us in on what it's like to be an executive chef. Yes, we see a lot of action in the kitchen, but most of it comes across as meaningless noise. I wanted to know what they were doing and how they knew when they are getting it right. I wanted to know how they were able to make so many different things. (Someone she make a movie set in the kitchen at The Cheesecake Factory. Have you seen their menu? There's like a million things on it. How do they make all of them?) The cooking scenes in Burnt drew me in, but the movie didn't have enough genuine heart to keep me there. If you want to see a movie about cooking which feels "real", check out Chef. Burnt assumes that kids like cakes which resemble brains on Blu-ray Disc courtesy of Anchor Bay Entertainment. The film has been letterboxed at 2.35:1 and the Disc contains an AVC 1080p HD transfer which runs at an average of 30 Mbps. The image is very sharp and clear, showing no overt grain and no defects from the source materials. The colors look very good and the image is never overly dark or bright. The level of detail is good and the picture is rarely soft. The depth looks fine for a drama with no "big" scenes. The Disc carries a DTS-HD Master Audio track which runs at 48 kHz and an average of 3.5 Mbps. The track provides clear dialogue and sound effects. The audio is surprisingly good, most notably during the kitchen scenes. We can hear distinct sounds of pots clanging and glasses clinking coming from the front and rear channels. The calls of "Yes, Chef!" also fills the speakers. Otherwise, we are treated to dialogue which comes mainly from the center channel. The Burnt Blu-ray Disc a small assortment of extras. We begin with an AUDIO COMMENTARY from Director John Wells and Executive Chef Consultant Marcus Wareing. The Disc contains five DELETED SCENES which run about 10 minutes and can be viewed with commentary by Wells. A few of these scenes, including one which shows Adam sticking up for a co-worker, should have been left in the movie. "Burnt: In the Kitchen with Bradley Cooper" (24 minutes) is a fairly standard making of which contains comments from the cast and creative team, as well as some on-set footage. But, we also get a lot of clips here which really pad the running time. Wareing also chimes in with his thoughts on the film's authenticity. A screening at the Screen Actors Guild yields the "Q&A Highlights with Director & Cast" (24 minutes) in which Cooper and crew discuss the film.